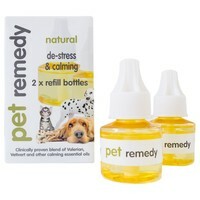 Pet Remedy Refill Pack is an easy way to refill your existing Pet Remedy Diffuser. Pet Remedy helps de-stress and calm your pet that may be nervous or anxious. A special blend of Valerian, Vetivert and other calming oils is diffused by the plug in diffuser which slowly releases potent calming properties into the surrounding area. Pet Remedy Diffuser is a great way to calm your pet when there are such things as fireworks which can be very distressing for pets. Love this - cheaper than Feliway, just as, if not more than, effective and half the price - whats not to love? Make sure you get the petremedy diffuser - the feliway diffuser is too hot and the product won't last as long. Contains valerian so may smell a bit odd - your nose will get used to it in a couple of days and it won't be so apparent.